This weeks blog has been written by Jenny who is very busy tending the kitchen garden in our Chipping Campden garden. It’s the first week of April, and today, at last, it feels like spring has arrived. The sun is out, the air feels warm, and I’ve just been visited by a very large bumble bee. The soil still feels chilly but maybe seeds will finally start germinating outside in the kitchen garden. With limited time available each week, the temptation is to sow seeds early in the greenhouse and outside in the beds. The stack of seed packets that could be sown in March, plus the even bigger stack for April begins to feel daunting. But with such a cold start to spring, seeds optimistically sown outside in March have yet to show (even under the cloches). But on this beautiful spring day, I can breathe a sigh of relief. Finally, neat rows of radish seedlings are peeking through the soil surface. This small victory, along with an array of flower and vegetable seedlings happily germinating in the greenhouse, is enough to boost the confidence levels again. The onions, shallots, garlic, and broad beans planted earlier in the year are growing well, so actually the outside area does not look too bare. 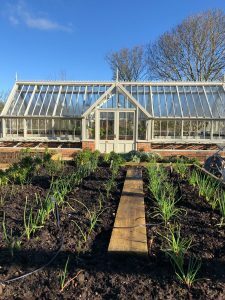 The greenhouse is also overflowing with overwintering pelargoniums, newly potted up dahlias, tomato, chilli, aubergine, and pepper seedlings plus brassicas ready to move to the cold frame for hardening off.